Plan Ahead When Booking : Choose your flight so you can begin to adjust your sleep schedule to your destination time zone on your flight. When departing to Asia, find an early morning flight to sleep partly on the way there, or a mid-afternoon flight and plan to stay up the entire flight then crash when you arrive. Time Your Sleeping: Many of us like to sleep the entire flight to pass the time on a long-haul flight, but fight that urge and get your body adjusted. Set your clock to your destination time zone and try to sleep during the nighttime hours of your destination to help ease the 12-13 hour adjustment. Go for a Long Walk: Unless you’re lucky enough to be flying in a layflat seat, you probably have some pretty sweet cankles going on when you land. Try to go for a mile or longer walk once you get on the ground to get that blood flowing again. Don’t Binge Sleep: Sleeping until the mid-afternoon sounds like a wonderful idea after a transpacific flight. It’s not. Trying to make up that sleep throws off your body clock. Follow your normal sleep schedule to help adjust quickly. Avoid Going to Bed Early: After returning, 7PM feels like midnight. Force yourself to stay up until your normal bedtime. Just as sleeping in until lunch throws you off, so does going to bed right after work. Hydrate! This one is probably beaten to death, but the low humidity in the flight cabin dries you out like a sponge in the Sahara. Drink lots of fluids before and during your flight. You’ll probably get up every few hours to use the bathroom, but that helps prevent cramping and keeps blood from pooling in your ankles too. Take Your Vitamins: Travel can wreak havoc on your immune system, among other things. Boost up the vitamin C so you don’t catch whatever Coughing Cathy sitting in the middle seat has. B12 also helps provide some balanced energy to help you with the jet lag. Indulge in the Carbs: I learned this trick when I was long-distance cycling. Carb-loading boosts your insulin levels to help adjust your body when you deviate from your regular resting and eating schedule. Go ahead; give in to those sweet pastries before you board or when you land. You’ll walk them off when you go for that mile recovery walk anyway. While these tips aren’t going to make you feel like a superhero at work the next day after a 15 hour flight and a 13 hour time change from Korea, you’ll be at least 70% of the way there. Here’s a bonus! These same tricks also work for transatlantic flights. If you can recover from a transpacific flight, transatlantic flights are a piece of cake. Caffineaholic, innovator, and world-traveler on a mission to live life and inspire others. I started exploring the country at an early age growing up around the country from San Francisco to Chicago, traveling from Florida to the Midwest. Now I’m living in New York City, but my second home is in the air. I love to always be on the go jet-setting somewhere fun. I have a passion for travel-hacking – the art and science of free or discounted travel. 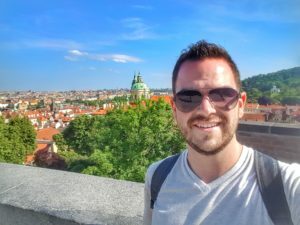 Whether it’s finding flight deals, credit card bonuses, or creating a crazy itinerary to squeeze in an extra city for a couple extra bucks, I enjoy it all. Bleisure's Best Finds: The End of Arm Jiggle and Evening Chills! Previous PostPrevious Bleisure’s Best Finds: The End of Arm Jiggle and Evening Chills!